The bottom middle right-swing door will be for the cigar-in-original-box storage. The top middle left-swing door will house my exclusive cigar boxes. The top flip-up will house the Singles, Tubos, Mini's, Club's and any quick-grab cigars or accessories. All compartments will have a tempered glass front and every bolt. hinge, handle will be plated to avoid rust. 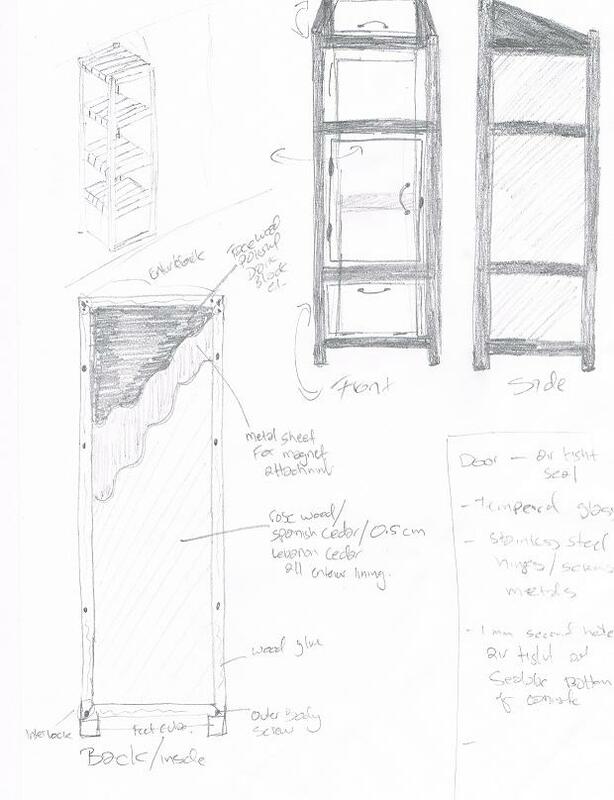 The inner backside of my humidor as you can see from the sketch will have a thin >1.5mm metal (magnetic) sheet in between the lining and outer frame. This will help me attache all my gadgets and gauges using a magnet for easy placements as well as to add weight to make the humidor more sturdy. Now my first challenge is finding the right wood and materials. After asking around and getting quotations on the wood, I have narrowed down my choices to use either imported Rosewood or Lebanese Cedar wood as the lining inside my humidor. As I gather all my materials now, we will go over specifics in Part 3 hopefully next week! After all this drama, its only fair to sit back and light up a spicy cigar.... Gurkha G-Series anyone? Yes I have been saving this baby for a while... so expect the review very soon! Storing your Cigars correctly and appropriately should be taken very seriously if you are a cigar aficinado. Cigars just don't mainly come out of their box ready to smoke unless they have been stored correctly. If you care about your cigars then you should care about where you keep them! Inside of the humidor should be made or lined with either Spanish Cedar or Rose Wood. (how would you know? well every good humidor has a product certificate, if it does not then return the humidor and dont risk it. make sure the inside wood has no cracks, loose edges or discoloration. make sure the metal hinges are plated or stainless to avoid any rust. Humidifier system & Hygrometer is the heart of your humidor, choose them wisely! (I personally stay away from those Green Oasis Foam that they use for plants as they tend to give an uneven humidity which can be hard to control.) Look for a system that has a wider meshed area to ensure even humidity distribution and an electronic gauge for accuracy. Humidor lids should have a good seal but not tight. When closing the humidor, if you can hear the wood on the lid touches the bottom wood, then that's a good seal. Choose the correct size (depending on number of cigars to be stored and cigar gauges). The outside design of the humidor has no impact on the Cigar so choose your fancy. Once you have your new humidor DON'T rush and put your cigars just yet unless you 'Condition' it first. Conditioning a Humidor require you to keep a stable humidity inside the box for a few days before you can actually use it for your cigars. The reason is that most Humidors dry up during storage and building back the humidity will take a few days as the lined wood inside the humidor 'conditions' to a relatively stable humidity. (ask whoever you buy the humidor from if they can condition it for you). Please use distilled water for your humidification system or 50/50 solution only (available @ your cigar shop). Always keep similar region cigars together. Avoid cramming cigars in a single Humidor. Have enough space inside for the Cigar to breath. remember you need to turn the cigars around every once in a while, the bottom ones move to the top and the top to the bottom. Putting different cigars in a humidor might rub off their flavors on each other (sometimes a good thing if you are ready to blend). attain to your humidor and check gauge at least once a week! The basics about storing your cigars is now out of the way. I currently have 6 Humidors (3 of which are 50 cigar holders, one 25 cigar holder, one 15 cigar holder and one 10 cigar holder. As my collection expands, my storage area is decreasing and in not looking forward to buying my 7th humidor as of yet, my house office space cannot accommodate another humidor. I have looked at a few large cabinet humidor but non really did it for me. So this is why I have this new task of building my own humidor! The way I want it! Yes, in the upcoming weeks you will get to see my progress on Building My Own Humidor task and hopefully the steps I am talking in making it happen. 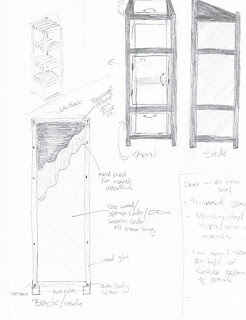 I am currently making my initial plans and sketches and will share them with you soon! If anyone would like to start this type of project with me do let me know as I an willing to offer my support.